10:00 to 16:30 pm both days. Gala programmes available for £1, to help support the cost of the event. Parking: Limited parking on site, additional parking available in Jays Close, opposite the Viables Craft Centre field. 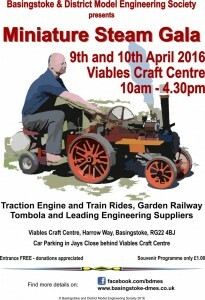 Miniature Steam Gala, we have 27 confirmed live steam traction engines. The miniature railway shall be operating both days (£2 per ticket), running two trains for paying passengers. Model boats and other models on display. Light refreshment available on site.